This special offer CAN be used in conjunction with two other discounts. Your gift card will be emailed to you the week after the conference has been held and your attendance has been confirmed. Amazon.com Gift Cards will be available for use until one year after the date of the conference you attended. Double your discount with Super Early Bird pricing if payment is received on or before April 5, 2013 and save up to $400 off your registration fees (depending on conference package selected). 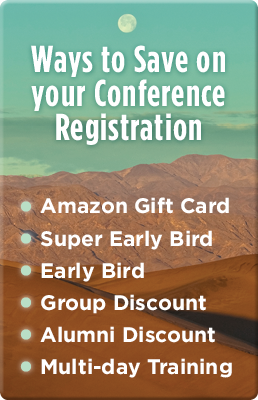 Receive up to $200 off the regular conference registration fees (depending on conference package selected) if payment is received on or before May 3, 2013. Check out the pricing page for discounts. Agile Development and Better Software alumni are eligible to receive up to $200 off their registration fee (depending on conference package selected). Additionally, if you are an alumni and are unable to attend the conference this year, you may pass your alumni discount onto a colleague. Please call the Client Support Group at 888.268.8770 or 904.278.0524 or email them at [email protected] for more details on this special discount offer. *Amazon.com is not a sponsor of this promotion. Except as required by law, Amazon.com Gift Cards ("GCs") cannot be transferred for value or redeemed for cash. GCs may be used only for purchases of eligible goods on Amazon.com or certain of its affiliated websites. Purchases are deducted from the GC balance. To redeem or view a GC balance, visit "Your Account" on Amazon.com. Amazon is not responsible if a GC is lost, stolen, destroyed or used without permission. For complete terms and conditions, see www.amazon.com/gc-legal. GCs are issued and ©2012 by ACI Gift Cards, Inc., a Washington corporation. ©,®,™ Amazon.com Inc. and/or its affiliates.